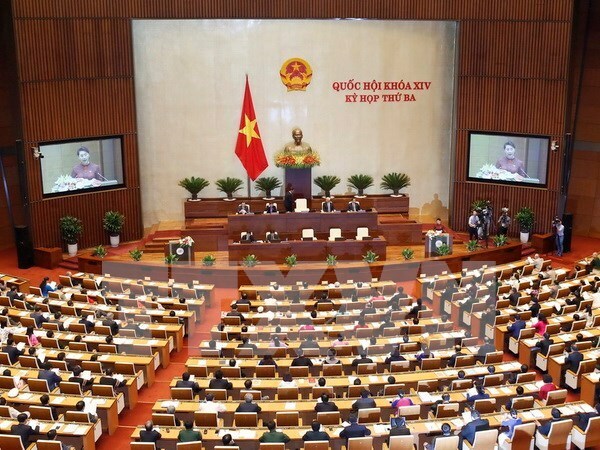 Hanoi (VNA) – The third plenary session of the 14th National Assembly opened in Hanoi on the morning of May 22 with the opening ceremony broadcast live on national television and radio channels. Earlier, the National Assembly deputies paid floral tribute to President Ho Chi Minh at his mausoleum and attended a preparatory meeting to approve the session’s working programme. Law making will be a major focus during the 22.5-day sitting, with 13 bills and 5 draft resolutions expected to be considered and adopted, and five other draft laws to be tabled for discussion. Among the bills scheduled to be passed at this session are some important ones of public interest, including the law on adjusting, supplementing a number of articles of the 2015 Penal Code, the law on support for small- and medium-sized enterprises, the law on management and use of State asset (revised) and the law on the State’s responsibility for compensation. The session will also examine and make decision on a number of important socio-economic matters and conduct supreme supervision of the implementation of laws and policies on food safety in 2011-2016. A report of the Vietnam Fatherland Front Central Committee on petitions and opinions of voters and the public will be submitted to the session, and the NA Standing Committee will report on its supervision of the settlement of voters’ petitions that were sent to the NA’s second plenary session.